Tomorrow at PhilaMOCA, the Cinedelphia Film Festival will screen Stanley Kubrick’s The Shining, concurrently superimposing the film playing backwards and forwards. Philadelphia’s own dark shoegazers, Psychic Teens, will simultaneously perform a live noise score (Full details and tickets here). A bizarre concept in theory and in practice; the idea stemmed from Spectacle Theater’s John Fell Ryan, who took literally a MSTRMND analysis of The Shining that read: “The Shining is a film meant to be watched both forwards and backwards.” Achieving popularity with the help of a conspiracy theory-oriented documentary about The Shining, Room 237, the concept is predicated on a symbiotic and symmetrical visual notion, that Kubrick’s cinematic sense of geometry is omnipresent. What ensues isn’t any sort of Internet easter egg, but rather a series of happy accidents: Wendy walking through the elevators of blood to bring Jack breakfast, “All work and no play make Jack a dull boy” typed over Wendy and Danny’s excursion into the labyrinth, Jack’s bloodied clown face over the murdered twins, to name a few. 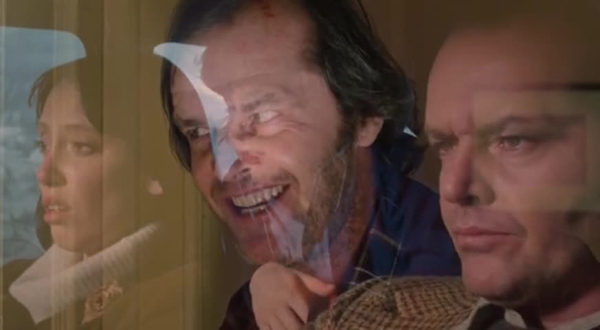 The act of doubling in the film manifests as Jack’s mental state decays. Kubrick frequently utilized mirrors in the film, suggesting a three-fold analysis of the actions: 1) the disconnect between the actual and the perceived, 2) the fragmentation of the identity, and 3) the cyclical nature of the narrative. Thus, the physical superimposition of the frame reinforces the diagetic duality that’s already occurring. Jack is mentally fragmenting, and with the visual overlay, physically fragmenting. Room 237 predominantly vacillates between Kubrick’s supposed aid in faking America’s filmed moon landing and various desperate theorists clinging to the notion that The Shining is, subconsciously to most, about their respective subjects. However, the attention to detail required to provide evidence for these, often wacky theories, strikes a chord with the serendipity of playing the film forwards and backwards. While neither seems intentional on Kubrick’s part, there is certainly value in one of the comments in the documentary that says, something to the effect of, what Kubrick intended is only so important. Meaning: it is possible, or even more likely, probable, that Kubrick had no intention of The Shining focusing on the genocide of Native Americans or the Holocaust (just two of the obsessive frameworks illustrated in Room 237). And yet, if a person, looking at a frame-by-frame analysis of the film, has enough visual evidence to support these off-the-wall hypotheses, than does Kubrick’s intention matter? Ultimately, an artist’s intention cannot be discounted. With that said, that doesn’t mean that Room 237 and Fell Ryan’s superimposition experiment don’t have worthwhile ideas to offer. The whole thing takes on the effect of intellectual montage, as Eisenstein described it: the juxtaposition of completely separate images to create its own meaning. The meaning, while perhaps conjured from scraps, enlightens, exhilarates, and is not to be missed.